This charming, west facing sunlit home has everything you will need for a fun filled vacation! This is truly a home, not just a vacation rental, elegantly appointed and furnished with every amenity needed for a relaxing vacation. Start your day with coffee on the spacious lanai, watching the calm water glowing in the morning sun or reading a book in the comfortable patio seating. Continue your day relaxing poolside, sun bathing and swimming in the heated pool and hot tub. Walk down to the private dock to fish or take your boat on an adventure to Fort Myers Beach, Sanibel and beyond! Don’t miss walking or biking in this lovely, safe neighborhood. 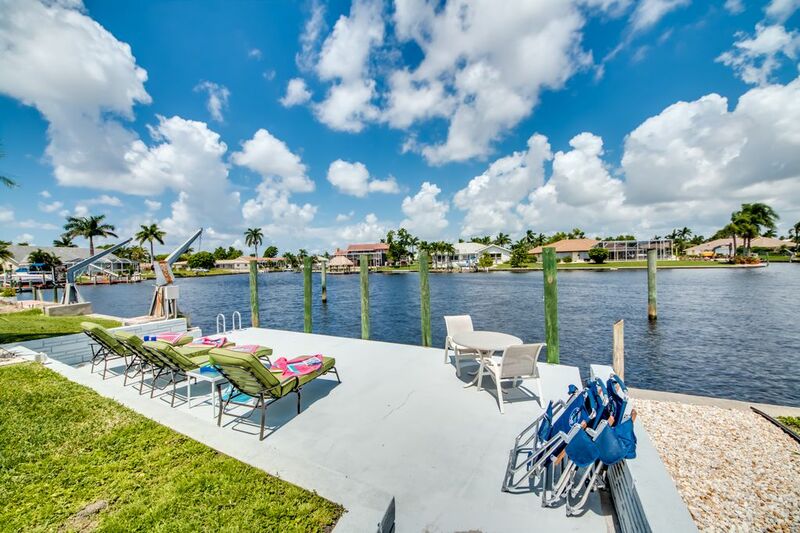 At days end, the best place to be in Cape Coral is right here on your private lanai, sipping a beverage and grilling fresh SW Florida seafood on the propane grill and watching the sky filled sunset. Featuring 3 bedrooms and 2 baths, the split layout provides privacy between the master suite and 2 guest rooms. The home will easily accommodate families, couples or singles traveling together. The master suite features a king bed, TV and large walk in shower. The 2 guest rooms, located on the opposite side of the home from the master, have a king bed in one and two twin beds in the other, which can be combined into a king bed upon request. There is also the opportunity to sleep 2 more people on a queen sleep sofa in the family room. The home is fully furnished with all the amenities you need for an easy vacation. Linens, towels, beach towels, Laundry soap, bath soap, dish detergent, fishing poles, cooler, gas grill, etc, etc, this is truly a home away from home. While there is plenty to do right at this vacation home, once you venture out of the neighborhood, you are close to beaches, a waterpark, shopping and restaurants. The Ford Edison Estate and Historical Museum is a must. For baseball fans, the winter training camps of the Boston Red Sox and Minnesota Twins are just 20 minutes away. The Disney parks are about 3 hours away. Great stay at this lovely Cape Coral home. The house was perfect for our family. There aren’t words that can describe this wonderful home. We had a 4 generation vacation here, and everyone had a fabulous time! The pool, the hot tub, the covered patio, the dock, the outdoor equipment all provided the perfect place so everyone could have a wonderful vacation! We ate our meals under the covered patio, and felt the breeze while we ate. The outdoor ceiling fans helped when the breeze wasn’t very strong. We felt like we were on a tropical island far away! Our children enjoyed the kayaks, the bicycles, the pool floats and the fishing dock very much! The well supplied kitchen, and outdoor grill made meals a breeze. The only downside was the traffic, which wasn’t a huge problem unless you were going very far. We did find a grocery that was closer than the Publix and Walmart, but not until the end of our visit. You are close to Forr Myers beach, and Sanibel and Captiva Island. If you are going to the islands, be sure to go early, or later in the day. Traffic on and off the island is very slow, but we’ll worth the trip. You will love this spot. The sunsets are spectacular! It just felt like home! The home was great. Had all the amenities we needed and it was nice to have the extra touches like beach towels, chairs, and a cooler since flying makes it impossible to pack those things. House was clean and well kept. The pool and hot tub were great! Kitchen was fully stocked with what we needed to cook all week and the addition of a grill was nice. The location of this house is fantastic for doing things all over. You can choose to sit and enjoy the water on the canal, which is nice and quiet, or it’s a quick drive to Sanibel, Captiva, Pine Island, or lots of other fun activities. If you’re looking for a nice quiet location for a family vacation or just to escape, this is the place. Would gladly rent again! Awesome location, beautifully equipped, decor fabulous. Owners Bruce & Sue , were very responsive & helpful. Would highly recommend! This place met or exceeded all our expectations for a Florida vacation. It was just as described. Comfortable beds and furniture. Kitchen is well stocked with tools and cookware. The location on this canal was beautiful!! We caught fish off the dock and got to enjoy beautiful sunsets. The hot tub was a relaxing treat we used several evenings. We took a half day boat tour with Bruce and were fortunate enough to stop and watch dolphin bob around the boat! This was a highlight and real treat!! We learned a lot about Cape Coral, docked for lunch, toured canals at St. James City on Pine Island, and enjoyed the afternoon cruising. From a seafood festival in Ft Meyers to flea market in Cape Coral, eating out and picking up fish at Merrick's (Larson's recommended fish market) to grill, we enjoyed many things to do in the area. The Activities and Attractions guide book provided by Sue and Bruce is full of Larson's favorite things...very useful! We hope to return to Cape Coral and rent from Sue and Bruce Larson again! What a fabulous property close to everything! The house has a wonderful hot tub for 3 and a nice sized electric heated pool. In addition they provided 2 kayaks and 2 bikes which we used daily! Thanks for such a wonderful experience!